Having the opportunity to start a business inside SAP that was initiated by the Executive Board is an honor and an entrepreneur’s dream. Starting that business, innovating, nurturing and growing your baby, and simultaneously enjoying the network and the powerhouse of SAP is a phenomenal combination. Being able to incubate—build a business inside of an established business—sounds like a startup without risk. Win-win, right? On the surface, yes. You think it is impossible to nurture and grow a startup within an established company? At SAP, we have proven that it is possible. SAP provides an environment for cultivating a startup into a sustainable new business. We are the live embodiment that it works. In comparing this startup experience with my previous 20 years at SAP, there is one thing that is definitely a constant: you have to fight for what you love. Building a startup inside SAP demands just as much blood, sweat, and tears as a startup outside. The other similarity is that no one is waiting for your novel idea with bated breath. Everyone is busy with their own deliverables, their own priorities and fires to fight. They may think what you are doing is cool, but they only really care if they can benefit from it. So, marketing your new business inside of SAP is just as challenging as any new, unknown startup brand trying to establish a foothold in the market. Some things you do in life change you forever. Eighteen months into my living my startup dream, I have changed; and what an incredible transformation that has been! It has changed my perspective towards that higher purpose, my desire of, in Steve Jobs’ words, “making a dent in the universe”. After living and breathing the “corporate feeling” for 20 years in different roles and leading a global organization of 3.000 people, I packed my bags in Germany and left for Silicon Valley in July 2016 in pursuit of this intrapreneurship. It has been about putting all my heart and soul into building up the new business: SAP Data Network. It was a natural step for me to follow my passion for innovation and drive change. Mind you, that journey from start-up to scale-up is extremely energy-intensive with lots of highs and lows, but simultaneously very rewarding. Even in the lowest of the low moments I have not had a single moment of regret! Be intentional about unlearning and changing specific behaviors when you embark in the vast unknown that is the startup world. Making the move from a corporate role to a startup job, often seems like the polar opposite. But truthfully, it is a combination of what to unlearn from your corporate job to do differently and what you keep from your corporate work background that benefits you in the startup. Large corporate skills such as ability to confidently engage with large enterprise customers, taking a business to profitable growth or developing a solid strategy carry over very well. Success in a startup also needs a clear vision and an almost obsessive focus on the customer with the people being the number one determinant of success. It’s all about getting the job done, achieving the results you set out. You wake up each morning and ask yourself: what can I do better today than I did yesterday. You will wear many hats during the course of one business day – from strategy to product to execution to selling. And by the way, closing is *way* harder than selling. You will make real trade-offs to get your innovation off the ground. Your resources are limited and you will do what it takes to get there. Many business or product ideas fail because the creator is simply too much in love with his/her own idea. There are countless stories of startups with amazing ideas, loaded with features and functions. But the business with the most features and functions doesn’t necessarily win in the market. And if the business model or pricing is not right, it will be dead on arrival. Test-driving different business models and pricing structures may be necessary before you get it right. Your elevator pitch is key to ensuring what your business is about. You or the customer? Practice, practice, practice your elevator pitch to anyone and everyone who will listen. Do this so that you can get to the value and essence of your business. Make sure that your elevator pitch is about the customer, not about what you want to get out of it. In practicing your elevator pitch, don’t get emotional about honest feedback. I know it’s hard when it’s your baby, but internalize the feedback. You don’t have to agree with it or even act upon it. Some of our best value propositions were honed after listening to customers and sales folks play back what they heard when we delivered our customer pitch. Our 1-liner for SAP Data Network is the following: We help customers unleash the revenue opportunities that are hiding within their own data. It’s clear, short and gets to the essence of what we are here to do for our customers. The first question I usually get after giving the one-liner is: so, are you a product, platform or service? This is where we have a problem. We preach to everyone that we commit to a business outcome. Yet we STILL think too many times in products, platforms and services instead of solutions. The answer I have to that question is: we are about solving business problems and helping the customer thrive through data. So, we are all the above. The customer comes to us with a problem or an opportunity. And it is our job to solve it or harvest it employing any of these means possible. There are many advantages of having a large corporation backing you, be it its brand power or using its established go to market channels. We leverage all of SAP’s leading-edge technology and go to market. But be clear, from the minute you launch your internal startup, you are on a clock. I am “genetically” an optimist, but If you cannot demonstrate tangible results quickly, your people will be coveted by other organizations. This was one of the reasons why we established our “Seeing is Believing” principle early in the journey, to ensure rapid experimentation and fast prototyping of our products. You are challenged again when you show sustainable success and start to grow. Organizations around you will start to take notice and may distract you from delivering on your customer mission, draining the startup energy out of the team. Be disciplined about always delivering for the customer. Even if you are successful by startup means, your achievements are still fairly small in comparison to the rest of the company. So, be sure to have thick skin, minimize bureaucracy and leverage all of your network gain allies to grow the business. Stay focused on the customer, keep leading the orchestra and keep firm in your conviction. As we started to innovate at the periphery of SAP’s established business and this edge begins to scale, it will strengthen—rather than endanger—the core business of SAP, thereby increasing your number of internal allies. In the beginning, your team is your business. All you have is an idea and a small team. Focus number one is building up your team with the right people vs. delivering content. You will be haunted for a long time if you reverse that order. I believe strongly in picking your own team, because you will be counting on every single team member to be CEOs in their own right with full accountability. It’s not a walk in the park and everyone has multiple roles and a long list of responsibilities. Therefore, you need people that share your same passion, vision and values as you start to build the brand. Choosing your own team is not a luxury, it is a necessity to realize your dreams. Be sure you choose people who are resilient and resourceful. If you cannot bounce back and go at it again from a different angle, you shouldn’t be doing this. Because chances are you won’t get your offering right the first time. Edison went through a thousand unsuccessful attempts at inventing the light bulb. The Wright brothers didn’t get it right the first time. The creator of Dyson vacuums went through over 5.000 failed prototypes and his whole life savings before it finally worked. Therefore, plan on it, know that you will need multiple iterations so that the failures are absorbable. For us in SAP Data Network, we did a lot of stealth testing for pricing, testing our messaging, even testing how we build products before we got it right. And we continue to learn with every customer engagement. Of course, when founding a startup, you have to iterate and circulate your vision, strategy and business plan. It has to be sound and it is not sufficient to only be written or seen by one person before you run with it. But at some point, enough is good enough. An entrepreneur’s critical challenge in building a startup is time. A speedy time-to-market could mean life or death. The only thing that matters to the outside world is the impact to customers. Get your customers to talk about you and the impact you drove for them. Stories evoke empathy. Customers are your best advocates and influencers that you could ever have. 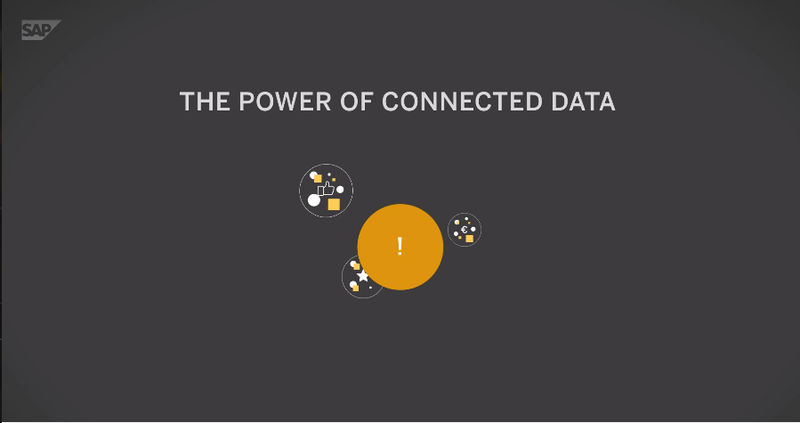 SAP Data Network was founded in May 2016 as a startup to help customers rapidly innovate through connected data and solve the complex challenges of going through digital transformation. We went “public” with our offering in Q2 this year and already have a rich customer pipeline. With every customer engagement, we are constantly expanding our mindset, beliefs, experiences and knowledge. It’s all about the journey, not the destination. If you feel you are an entrepreneur at heart, follow your dream. What’s the worst that could happen? You might fail, but I guarantee you will learn from it and you will find a new mountain to climb.